Cleaning can be really time consuming in our hasty society. Calculating the time you need to make the cleaning process efficient can be quite discouraging. The good news is that those who cannot hire professional cleaning company can follow their advice. And the tips of the professional cleaners are not to be ignored. The tips that our expert cleaners propose here are not in strict order and you can re-arrange and add additional topics as much as you please. On thing is certain – these tips are essential. 1. Always make sure that you schedule your cleaning chores. This is one similarity between professional carpet cleaners and modern housewives. The daily, monthly and seasonal projects could be done faster with good planning. 2. A bit contradicting the aforementioned, you should always be ready for emergency and be flexible. 3. Ignore the distractions. 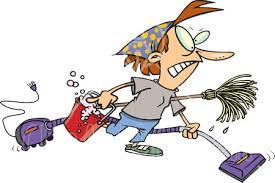 You won’t be doing a proper cleaning project while watching TV, arguing with your husband or drowning into Facebook. Well, of course, your favourite tracks can do miracles with your speed. 4. Organise a cleaning party. This means that your family should always help you. That way you can avoid the awkward moment when you clean while somebody else is watching cartoons. 5. Don’t clean items which are not dirty. This is just like “if it’s not broken, don’t fix it”. 6. Clean as you go and from top to bottom. Don’t leave anything spilled for later and clean the high objects first. All these valuable tips, provided by our cleaners will make you do the cleaning chores easily and make you feel like the cleaning professionals. There are millions of tips on how to clean different items and how to properly react in various situations involving random spills, stains, odors and so on. That is quite useful because cleaning is inevitable part of our lives and has many aspects. There is no doubt that we all prefer someone else to do the cleaning for us but that is an expensive service and not many can afford to take advantage of it on a regular basis. We will provide you with a few tips which cover the most common situations even though some of them are quite unusual. 1. You can use baby-wipes for all kinds of carpet or fabric stains. 2. The best approach to treat ink stains is by applying alcohol. When you are dealing with a stain, never rub but blot carefully, otherwise you will make the spot spread even wider. 3. Get rid of unpleasant odours: one cup of white vinegar in your refrigerator will absorb the smell of spoiled food or other strong odors; for bathrooms it is appropriate to keep an open box of soda. 4. When you move heavy furniture off a carpet often there are some pressure marks left on its surface. To make that area fluffy again place an ice cube on it. After it melts down and the area dries the problem would have disappeared as well. 5. If candle wax drops upon fabrics (cloths, carpet and so on) remove the exceeded amount of wax with a spatula or a dull knife. After that place a paper bag and iron the affected area. The wax will melt and transfer onto the paper bag. Prevention measures and regular maintenance is essential when you are a tenant or owner – that may save you a ton of money and problems when it comes to your security deposit.